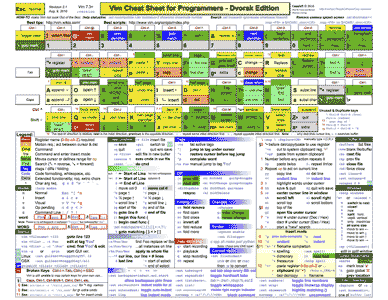 I found this intense Vim cheat sheet, and noticed that the author, Michael, had made the Excel 2011 sources available. Furthermore, he was kind enough to give it a Copyleft license. Being a user of the Dvorak keyboard layout, I took a few moments tonight to adapt the 300dpi color version to Dvorak. I’m making them available to download them for free, just like the originals. Other than the key layout changes, I bumped the version from 2.0 to 2.1, and updated the dates. I don’t have any immediate plans to adapt the original low-res, monochrome, or accessible versions of the cheat sheet, but I’m more than happy to accept contributions from anyone, and make them available here.